This article is about the city. For the province, see Almaty Province. "Verniy" redirects here. For the Soviet destroyer turned over from Japan, see Japanese destroyer Hibiki (1932). Almaty /ˈælməti/ (Kazakh: Алматы, translit. Almaty [ɑlmɑˈtə]; Russian: Алматы [ɐlmɐˈtɨ]), formerly known as Alma-Ata /ˌælmə.əˈtɑː/ (Russian: Алма-Ата, translit. Alma-Ata) and Verniy (Russian: Верный, translit. Vernyy), is the largest city in Kazakhstan, with a population of 1,801,713 people, about 8% of the country's total population  and more than 2 million in its built-up area that encompasses Talgar, Boraldai, Otegen Batyr and many others suburbs. It served as capital of the Kazakh state in its various forms from 1929 to 1997, under the influence of the then Soviet Union and its appointees. In 1997, the government relocated the capital to Astana (renamed as Nursultan) in the north of the country and about 12 hours away by train. Left to right, top to bottom: Ascension Cathedral in Panfilov Park; Kazakh-British Technical University; Panoramic view of Almaty from the hills of the Kok Tobe; Abay Opera House; Golden Warrior Monument in the Republic Square; Entrance gate to the Park of the First President; View of the Almaty Tower. Almaty continues as the major commercial and cultural centre of Kazakhstan, as well as its most populous and most cosmopolitan city. The city is located in the mountainous area of southern Kazakhstan in the foothills of the Trans-Ili Alatau at an elevation of 700–900 m (2,300–3,000 feet), where the Large and Small Almatinka rivers run into the plain. The city has been part of the UNESCO Creative Cities Network in the area of music since November 2017. 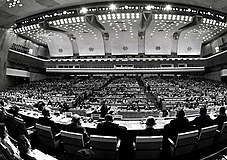 The city was the host for a 1978 international conference on Primary Health Care where the Alma Ata Declaration was adopted, marking a paradigm shift in global public health. From 1929 to 1936, Almaty was the capital of Kazakh ASSR. From 1936 to 1991 it was the capital of Kazakh SSR. 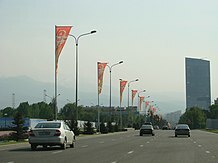 After Kazakhstan became independent in 1991, Almaty continued as the capital until 1997, when Astana was designated a return to the historic capital. Almaty remains the largest, most developed, and most ethnically and culturally diverse city in Kazakhstan. Due to development by the Soviet Union and relocation of workers and industries from European areas of the Soviet Union during World War II, the city has a high proportion of ethnic Russians and Ukrainians. The city is in the foothills of Trans-Ili Alatau (or Zailiysky Alatau) in the extreme south-east. It has a relatively mild climate with warm summers and quite cold winters. Since the city is in a tectonically active area, it has an endemic risk of earthquakes. Although most do not cause any significant damage, Almaty has suffered some large destructive earthquakes. In 1997 the capital was moved to Astana in the north-central part of the country. Since then Almaty has been referred to as the 'southern capital' of Kazakhstan. The name Almaty has its roots in the medieval settlement Almatu, that existed near the present-day city. A disputed theory holds that the name is derived from the Kazakh word for 'apple' (алма), and is often translated as "full of apples". Originally it was Almatau which means Apple Mountain. The Russian version of the name was Alma-Ata (Kaz. Father of Apples). Since gaining its independence from the Soviet Union, the use of the Kazakh Almaty is accepted. There is great genetic diversity among the wild apples in the region surrounding Almaty; the region is thought to be the apple's ancestral home. The wild Malus sieversii is considered a likely candidate for the ancestor of the modern domestic apple. The city's name was written as آلماتی Ālmātī in Turkish and Persian written with the Perso-Arabic script. During 1000–900 BC in the Bronze Age, the first farmers and cattle-breeders established settlements in the territory of Almaty. During the Saka period (from 700 BC to the beginning of the Christian era), these lands were occupied by the Saka and later Wusun tribes, who inhabited the territory north of the Tian Shan mountain range. Evidence of these times can be found in the numerous burial mounds (tumuli) and ancient settlements, especially the giant burial mounds of the Saka tsars. The most famous archaeological finds have been "The Golden Man", also known as "The Golden Warrior", from the Issyk Kurgan; the Zhalauly treasure, the Kargaly diadem, and the Zhetysu arts bronzes (boilers, lamps and altars). 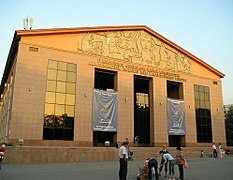 During the period of Saka and Wusun governance, Almaty became an early education centre. During the Middle Ages (8–10th centuries), a city culture developed in Almaty. There was a transition to a settled way of living, the development of farming and handicrafts, and the emergence of a number of towns and cities in the territory of Zhetysu. In the 10–14th centuries, settlements in the territory of the so-called "Greater Almaty" became part of the trade routes of the Silk Road, which reached from China to western Asia and Europe. At that time, Almaty became one of the trade, craft and agricultural centres on the Silk Road. It had an official mint. The city was first mentioned as Almatu in books from the 13th century. In the 15th–18th centuries, the city was in decline as trade activities were decreasing on this part of the Silk Road. European nations were conducting more trade by shipping. This period was one of crucial ethnic and political transformations. The Kazakh state and nation were founded here, close to Almaty. The Dzungar invaded, dominating the Kazakh people for a period. The Kazakh fought to protect their land and preserve independence. In 1730 the Kazakh defeated the Dzungar in the Anyrakay mountains, 70 kilometres (43 miles) north-west of Almaty. During the eighteenth century, the city and region was roughly on the border between the Khanate of Kokand and Qing Empire. It was then absorbed as part of the Russian Empire in the 1850s. 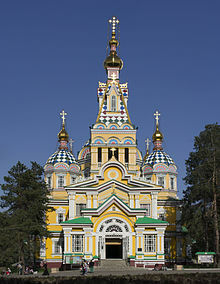 Zenkov Cathedral, a 19th-century Russian Orthodox cathedral located in Panfilov Park, is the fourth tallest wooden building in the world. To defend its empire, Russia built Fort Verniy near the Zailiysky Alatau mountain range between the Bolshaya and Malenkaya Almatinka rivers. Construction began on 4 February 1854 and was nearly completed by the autumn of that year. The fort was a wooden palisade, shaped like a pentagon, with one side built along the Malaya Almatinka. Later, the wood fence was replaced with a brick wall with embrasures. The main facilities were erected around the large square for training and parading. In 1855 Kazakhs displaced from their nomadic territory appeared in Verniy. Since 1856, Verniy started accepting Russian peasants. They founded the Bolshaya Almatinskaya Stanitsa (Cossack village) near the fortification. The inflow of migrants was increasing and led to the construction of the Malaya Almatinskaya Stanitsa and Tatarskaya (Tashkentskaya) sloboda. It was the place of settlement for Tatar merchants and craftsmen. In 1867 Verniy Fort was developed as a town called Almatinsk; the town soon returned to the name Verniy. According to the First City Plan, developed by administrators of the Russian Empire, the city perimeters were 2 kilometres (1 mile) on the south along Almatinka river, and 3 kilometres (2 miles) on the west. The new city area was divided into residential parts, and the latter into districts. Three categories of city buildings were defined. Category I and II buildings were of one or two-storied construction with a high semi-basement; they were erected around and in the centre of the city, others on the outskirts. On 28 May 1887, at 4 a.m., an earthquake almost totally destroyed Verniy in 11–12 minutes. Brick buildings were damaged the most, as they broke apart because of lack of flexibility. As a result, people were afterward inclined to build one-storied buildings made of wood or adobe. By 1906, the population of the city had grown to 27,000, two-thirds of whom were Russians and Ukrainians. In 1918 following the Russian Revolution and the establishment of the Bolshevik government, Soviet power was established in Verniy. The city and the region became part of the Turkestan Autonomous Soviet Socialist Republic (RSFSR). On 5 February 1921 Verniy was renamed Alma-Ata, one of the cities ancient names, by a joint consultation of regional government representatives, professional trade associations, and local faith-based groups. In 1926, the Council of Labor and Defence approved the construction of the Turkestan-Siberia Railway that was a crucial element of the future growth of Kazakhstan, especially in the east and southeast of the region. The Turkestan-Siberia Railway construction also had a decisive economic impact that strongly influenced the destiny of Alma-Ata as the capital of the Kazakh ASSR. In 1930 the construction of the highway and railway to Alma-Ata was completed. On 29 April 1927, the government decided to transfer the capital of the Kazakh Autonomous Soviet Socialist Republic from Kyzyl-Orda to Alma-Ata, within the RFSFR. This attracted more trade and people working with the government, stimulating intensive development in the city. On 31 January 1928, Leon Trotsky, leader of the 1917 October Revolution, accompanied by his wife Natalia Sedova and his son Lev Sedov, was exiled to Alma Ata by Joseph Stalin, then head of the Bolshevik party in Moscow. Trotsky was expelled from Alma-Ata to Turkey in February 1929, and went into exile in Mexico City. The Alma-Ata airport was opened in 1930, opening up a direct connection from Alma-Ata to Moscow, the center of the Soviet government. Alma-Ata became the main entry by air to Kazakhstan, a status which it retains today. Transformation of this small town into the capital of the Kazakh SSR was accelerated by the large-scale construction of new administrative and government facilities and housing. The Great Purge of the Stalin era extended to Kazakhstan, where numerous intellectuals, activists, leaders, teachers and others were killed. The Soviet government dominated the population. During the 1930s Kazakh nomads suffered starvation after disruption of their traditional living patterns. In 1936 the Architecture and Planning Bureau developed a plan to enhance Alma-Ata as the new cultural capital of the Kazakh SSR. The plan was based on the existing rectangular system of districts. They were to be strengthened and reconstructed. During World War II the government dramatically affected the city's population and structures. To better organize the home front and concentrate industrial and material resources, the government evacuated 26,000 people and numerous industries from the European theatre of war. Alma-Ata hosted over 30 industrial facilities removed from the European section of the USSR, 8 evacuated hospitals, 15 institutes, universities and technical schools; and around 20 cultural institutions. Motion picture production companies from Leningrad, Kiev, and Moscow were also moved to Alma-Ata at this time. This brought in so many ethnic Russians that the Kazakhs became a minority in the region. Over 52,000 Alma-Ata residents received the title: Gratitude for Your Self-Denying Labour. Forty-eight residents were granted the title of Hero of The Soviet Union. Three rifle divisions were raised in Alma-Ata, including the well-known 8th Guards Rifle Division 'Panfilov' (originally the 316th rifle division), along with 2 rifle battalions and 3 aviation regiments that were raised on the bases of the air club of Alma-Ata. After 1941, due to the mass evacuation of factories and workers from the European part of the Soviet Union during World War II, Alma-Ata became an administrative and trading centre. Although it had an underdeveloped industrial base it become one of the largest industrial centres of the Soviet Union. It was to the rear of the wartime fronts. During the years 1941–1945 the industrial potential of the city increased significantly. Development increased during the postwar years. The population of the city grew from 104,000 in 1919 to 365,000 in 1968. By 1967 the city had 145 enterprises, with the bulk of these being light industrial and food industries. Light industry: textiles, fur, knitting, carpets, footwear, apparel, printing, and the Almaty Cotton combine. Heavy industry: electrical engineering, foundry engineering, car repair, bearing repair, building materials, woodworking, concrete structures and structural elements, and house-building. From 1966 to 1971, 1,400,000 square metres of public and cooperative housing were built. Annually, around 300,000 square metres of dwellings were under construction. Most of the buildings constructed during this time were earthquake-proof multi-storey buildings. The Soviet government tried to diversify architectural forms to create a more varied cityscape. During this period, many schools, hospitals, cultural, and entertainment facilities were constructed, including Lenin's Palace, the Kazakhstan Hotel, and the "Medeo" sports complex. 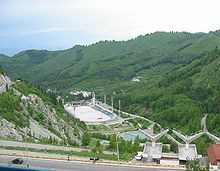 The Medeu Dam, designed to protect the city of Almaty and the Medeo skating rink from catastrophic mudflows during flood season, was built in 1966. It was reinforced a number of times in the 1960s and 1970s. The supersonic transport Tupolev Tu-144 went into service on 26 December 1975, carrying mail and freight between Moscow and Alma-Ata in preparation for passenger services; these began in November 1977. The Aeroflot flight on 1 June 1978 was the 55th and last scheduled passenger flight of the Tu-144. Alma-Ata was the host city for a 1978 international conference on Primary Health Care. The Alma Ata Declaration was adopted, marking a paradigm shift in global public health. On 16 December 1986, the Jeltoqsan riot took place in response to General Secretary Mikhail Gorbachev's dismissal of Dinmukhamed Kunayev. On 7 September 1988, the subway Almaty Metro project started construction; the subway was opened on 1 December 2011 after 23 years. Kazakhstan declared its independence from the Soviet Union on 16 December 1991 (Kazakhstan Independence Day), and two years later the government renamed the city from the Russian Alma-Ata to the Kazakh name Almaty. In 1997 the President of the Republic of Kazakhstan Nursultan Nazarbayev approved the Decree to transfer the capital from Almaty to Astana in the north of the country. On 1 July 1998 a law was passed to establish the special status of Almaty as a scientific, cultural, historical, financial, and industrial centre. The new General Plan of Almaty for 2030 was developed in 1998. It is intended to create ecologically safe, secure, and socially comfortable living conditions in the city. The main objective is to promote Almaty's image as a garden-city. It proposes continued multi-storied and single-housing development, reorganization of industrial districts or territories, improving transport infrastructure, and expanding the Almaty Metro. The first line of the Almaty metro was launched on 1 December 2011, two weeks ahead of schedule. The extension of the line to Kalkaman was opened in 2015. Nevertheless, Almaty has developed a major problem with air pollution. Already in 1995, particulate emissions, then mostly from the city's thermal power station, exceeded Kazakh and EU standards by over 20 times. In 2008, Almaty was ranked the 9th most polluted city in the world. A 2013 study identified cars as a major source of pollution, and it was noted since 2003 and 2013 morbidity had increased by a factor of 1.5, and that the city takes the first place in the republic on respiratory, endocrine and blood diseases, cancer and bronchial asthma, even though there are no major industrial installations. An independent local air quality monitoring system with a mobile app was launched in 2017. The area of the city has been expanded during recent years with the annexation of the suburban settlements of Kalkaman, Kok Tube, Gorniy Gigant District (Mountain Giant). Numerous apartment blocks and office skyscrapers have transformed the face of the town, which has been built into the mountains. Almaty was the site of a notorious terrorist attack in July 2016, when Jihadist Ruslan Kulikbayev killed eight police officers and two civilians in a shootout and car chase. Kulikbayev was wounded during the shootout and later sentenced to death for the attack. 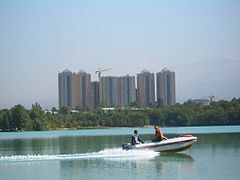 The climate in Almaty is a humid continental climate (Köppen climate classification: Dfa) with hot summers and cold winters. It is characterized by the influence of mountain–valley circulation. This is especially evident in the northern part of the city, located directly in the transition zone of the mountain slopes to the plains. Annual average air temperature is equal to 10 °C (50 °F), the coldest month is January, −4.7 °C (24 °F) (on average), the warmest month (July) 23.8 °C (75 °F) (on average). In average years frost starts on about 14 October and ends on about 18 April, with sustained extreme cold from about 19 December to about 23 February, a period of about 67 days. Weather with temperature above 30 °C (86 °F) is average for about 36 days a year. In the center of Almaty, like any large city, there is a "heat island" – the average daily temperature contrast between the northern and southern suburbs of the city is 3.8% in the coldest days and 2.2% in the hottest five days. Therefore, frost in the city center starts about 7 days later and finishes 3 days earlier than in the northern suburbs. Annual precipitation is about 650 to 700 mm (25.6 to 27.6 in). April and May are the wettest months, during which about a third of the city's annual precipitation is received. It is not uncommon to see snow or a cold snap hitting Almaty as late as the end of May. For example, in the last quarter century, such snowfalls were recorded on 13 May 1985, 1 May 1989, 5 May 1993 and 18 May 1998. The record latest snowfall in Almaty was on 17 June 1987. Almaty sometimes experiences winter rain, despite heavy preceding snowfall and low temperatures. The most memorable winter rain took place on 16 December 1996 during a military parade to celebrate the 5th anniversary of the Independence of the Republic. Almaty Weather Station's GM mostly records south-easterly wind (30%), its resistance increases during the summer (37%) and falls in winter (19%). Wind speeds exceed 15 m/s on about 15 days a year, on average. Industrially developed and densely populated areas in the south and southeast of Kazakhstan are situated in the zones where the maximum magnitudes of expected earthquakes are from 6.0 to 8.3 (the intensity of I0=8–10). K – indicates the energy of the earthquake. In each of these earthquakes, the city suffered wide destruction. The Territory of the Kyrgyz State adjoins North Tian-Shan. As of February 2015[update] the national statistics committee reported Almaty's population as 1,797,431. This was a 37% increase upon the 1999 census figure of 1,129,400, and 44% higher than the 1989 USSR census figure of 1,071,900. 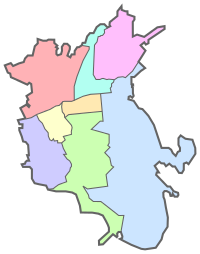 The metropolitan area centred upon Almaty includes the cities and towns of Esik, Kaskelen, Talgar, and Kapchagay, and much of Enbekshikazakh, Jambyl, Ile, and Talgar districts, all of which lie within 1.5 hours travel of Almaty city. Almaty generates approximately 20 per cent of Kazakhstan's GDP (or $36 billion in 2010). The nation is the most powerful economically in Central Asia and Almaty is a key financial center. It is considered to be a Beta- Global City as of the 2012 GaWC study. One of the largest industries in Almaty is finance, and its financial exports make it a large contributor to Kazakhstan's balance of payments. Almaty is home to BTA Bank, which is the largest bank in Central Asia, Kazkommertsbank, and other major banks. The Kazakhstan Stock Exchange is based in Almaty. Almaty is also developing as a regional financial and business centre (RFCA). 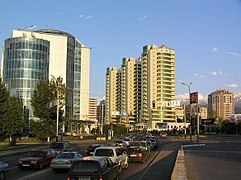 Under construction is the 'Almaty Financial District and Esentai Park'. This was designed by T.J. Gottesdiener, who designed both 7 World Trade Center in New York City and Time Warner Center in Tokyo Midtown, respectively. Its goal is to become the largest business centre in Central Asia. Esentai Tower, a 37-floor building in the park, is the tallest mixed-use building in Kazakhstan, housing offices of companies such as Ernst & Young, HSBC and Credit Suisse. The first Ritz-Carlton Hotel in Kazakhstan opened in 2013 in Esentai Tower. Along with professional services, media companies are concentrated in Almaty. The media distribution industry has been growing rapidly since 2006. Major broadcasting channels KTK and NTK are based in Almaty, as are several national newspapers. There are plans to construct a Western Europe-Western China highway, passing through Almaty. A new airport in Almaty expects to handle about 45 million tonnes of cargo each year. Air Astana is headquartered in the Air Astana Centre 1 in Almaty. 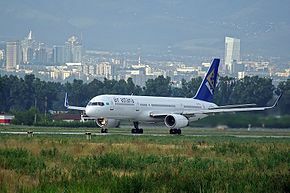 Prior to their dissolution, Air Kazakhstan and Kazakhstan Airlines were also headquartered in Almaty. The economy of Almaty city and Almaty Region continues to grow, and is expected to increase by nearly 6.5 percent per year until 2020. To mitigate the rapidly increasing electricity demand caused by this growth, the Kazakh authorities decided to upgrade the power system by building the new transmission line and modernizing the substations. The Alma Transmission Project, supported by the World Bank, has helped achieve this goal. An aerial tramway line connects downtown Almaty with a popular recreation area at the top of Kök Töbe (Kazakh: Көк-төбе, which means 'Blue Hill'), a mountain just to the southeast. The city television tower, Almaty Tower, is located on the hill. It has a variety of tourist attractions, such as a zoo, amusement-park-style rides and restaurants. According to the city's Department of Natural Resources and Resource Use Management, as of 2007[update] the city has 125 fountains. Among them is the "Oriental Calendar" Fountain, whose 12 sculptural figures represent the 12 animals of the Kazakh 12-year animal cycle (similar to its Chinese counterpart). The Medeu is an outdoor speed skating and bandy rink. It is located in a mountain valley (Medeu Valley, or the valley of Malaya Alma-Atinka River) on the south-eastern outskirts of Almaty, Kazakhstan. Medeu sits 1,691 metres above sea level, making it one of the highest skating rinks in the world. It has 10,500 square meters of ice and utilizes a sophisticated freezing and watering system to ensure the quality of the ice. Shymbulak is a ski resort near Almaty, located in the upper part of the Medeu Valley in the Zaiilisky Alatau mountain range, at the elevation of 2,200 metres (7,200 ft) above sea level. The resort area is about 25 kilometres (16 mi) south of Almaty city by the Medeo road. It is popular for its mild climate, a large quantity of sunny days and a great amount of snow through the winter (from November till May). First President's Park is an urban park located in Almaty at the intersection of Navoi Street and Al-Farabi Avenue in the Bostandyk district. The park was opened in July 2010. Creation of the park began in 2001. The park is broken into three main areas - the avenue, boulevard, and dendrological areas. Greenery was planted according to dendrological plan. In honor of the participation of the city of Almaty in the Olympic torch relay of the Beijing Olympic Games, approximately one hundred spruces and birches were planted. In 2011, a hundred Tien-Shan spruces were also planted. Plans include a set of water projects over an area of 9.5 hectares. Big Almaty Lake is a natural lake located in Trans-Ili Alatau mountains on 2511 above the sea level near Almaty (15 km South from Almaty). Like a majority of lakes in Trans-Ili Alatau, this lake formed as the result of an earthquake. The lake is a major source of drinking water for the region. People can access the lake by car (approximately 1 hour drive from the city center), bike, or hiking (approximately a half-day trip). 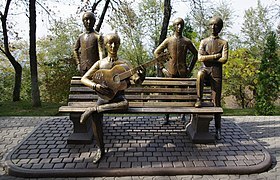 The Park of 28 Panfilov Guardsmen is a major park in Almaty, Kazakhstan. 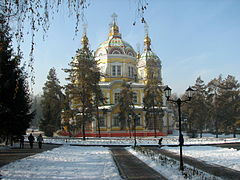 The park is located in east-central Almaty in the area surrounding Zenkov Cathedral. It is dedicated to and named after the Panfilov Heroes, 28 soldiers of an Almaty infantry unit who died fighting Nazi German invaders outside of Moscow in World War II. The group takes its name from Ivan Panfilov, the General commanding the 316th division which, in spite of heavy casualties, believed at that time managed to significantly delay the Germans' advance on the capital, buying time for the defenders of the city. 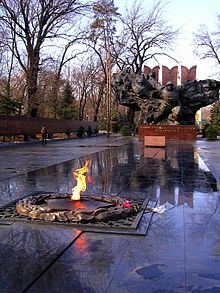 An eternal flame commemorating the fallen of the Russian Civil War and the Great Patriotic War burns in front of the giant black monument of soldiers from all 15 Soviet republics. Almaty International Airport is the largest airport in Kazakhstan. The closest airport to Almaty is Almaty International Airport located 15 kilometres (9.3 mi) to the northeast. Sayran Bus Terminal provides intercity bus connections within Kazakhstan, as well as international connections to Kyrgyzstan and China and regional bus connections west of the city. Sayakhat bus terminal provides regional bus connections to places north and east of the city. Since September 2016, a bicycle-sharing system, Almaty-bike allows going around the city by bicycle. 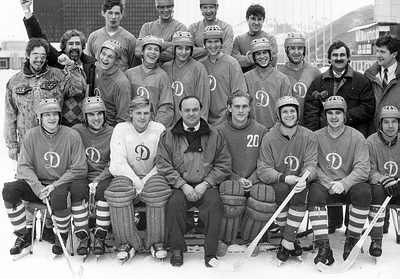 The historic bandy team Dinamo won the Soviet Championships in 1977 and 1990 and the European Cup in 1978. Their home ground was Medeu. Bandy was introduced for the first time at the 2011 Winter Asian Games. Medeu was the main arena at the 2012 Bandy World Championship. The second arena built for the championships is an alternative field at Almaty Central Stadium. The city is now a candidate to host also the 2020 Bandy World Championship. The Federation of International Bandy has opened an office for Asia, which is located in Almaty. Almaty will be the host of the 2017 Winter Universiade with bandy on the programme. The 2011 Asian Winter Games were held jointly in Almaty and Astana. The ice hockey and ski jumping competitions were held in the city at the Baluan Sholak Sports Palace and Sunkar International Ski Jumping Complex respectively. The biathlon, cross-country skiing and ski orienteering competitions were held at the nearby Soldatskoe Valley Cross Country Skiing and Biathlon Stadium; the Alpine skiing and bandy competitions were held in nearby Shymbulak and Medeo respectively. The city's primary football team is FC Kairat founded in 1954 and one of the most successful Kazakh clubs. Its basketball team BC Almaty won the 2015 and 2016 editions of the Kazakhstan Basketball Cup. 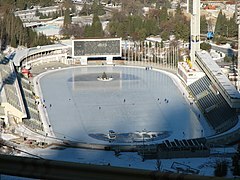 Following the successful hosting of the 2011 Winter Asian Games, Almaty made a bid to host the XXII Olympic Winter Games in 2014, but was eliminated from consideration, not making the "short list" of candidate cities. Almaty was the 2017 Winter Universiade host. The city was exploring possible bids, such as the 2018 Winter Olympics, but did not submit one. Almaty submitted a bid to host the 2022 Winter Olympics in August 2013, but lost to Beijing. The fictional espionage novel Performance Anomalies takes place in Almaty, Kazakhstan and many of the city's landmarks make an appearance, including Panfilov Park, Zenkov Cathedral, The Kazakh Museum of Folk Musical Instruments, Kok-Tob (Kök Töbe), Shymbulak, Zelyony Bazaar, and several well-known avenues. In Command & Conquer: Generals, GLA forces ambush several UN and US supplies in bound to the people of Almaty. Note the difference of the real Almaty to the one described. Igor Sysoev (born 1970) open-source software engineer, founder of nginx, Inc.
^ "Code Of Access". Almaly.almaty.kz. Retrieved 2 January 2012. ^ a b "Об изменении численности населения Республики Казахстан с начала 2017 года до 1 декабря 2017 года (Citizenship of the Republic of Kazakhstan ... to 1 December 2017)" (in Russian). Stat.gov.kz. 4 January 2018. ^ "Население". Stat.kz. Archived from the original on 4 January 2013. Retrieved 11 January 2013. ^ a b Brummell, Paul; Oleynik, Maria (2018). Kazakhstan. Bradt Travel Guides. p. 26. ISBN 9781784770921. ^ "Almaty included into network of the creative cities of UNESCO" (in Russian). Retrieved 3 October 2018. ^ "History and meaning of the city names in Kazakhstan - статьи, истории, публикации | WEproject". weproject.kz (in Russian). Retrieved 25 September 2017. ^ Nabhan, Gary Paul (May – June 2008). "The Fatherland of Apples". Orion Magazine. Retrieved 4 February 2013. ^ a b "History of Almaty". Almaty.kz. Retrieved 2 January 2012. 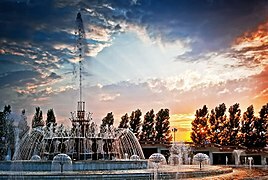 ^ "Sights of Almaty | Registon Travel". www.registontravel.com. Retrieved 25 September 2017. ^ Ness, Immanuel. Encyclopedia of World Cities. M E Sharpe Reference, 1999. ISBN 0-7656-8017-3. Page 19. ^ "History of Almaty :: Echoes of Past Centuries. Almaty history. The city of Almaty". kazakhstan.orexca.com. Retrieved 25 September 2017. ^ "В Алматы открылся Метрополитен (фото)". Zakon.kz. Retrieved 20 June 2015. ^ a b "History of Almaty". Retrieved 6 April 2018. ^ CRE Group (1995). Almaty Air Quality Study (TA 2262-Kaz) (PDF) (Report). Asian Development Bank. p. i. Retrieved 22 January 2018. ^ "Almaty is one of ten most polluted cities in the world". Kazakhstan Today. 5 March 2008. Retrieved 22 January 2018. ^ Carlsen, Lars; Baimatova, Nassiba; Kenessov, Bulat; Kenessova, Olga (2013). "Assessment of the Air Quality of Almaty. Focussing on the Traffic Component". International Journal of Biology and Chemistry. 5 (1): 49–69. ^ Shatayeva, Lyazzat (2 February 2017). "New App Helps Almaty Residents Monitor Air Quality". Astana Times. Retrieved 22 January 2018. ^ "Almaty Urban Air". auagroup.kz. Retrieved 22 January 2018. ^ "Climate of Almaty". Погода и Климат. Retrieved 13 January 2015. ^ "Almaty Climate Normals 1961–1990". National Oceanic and Atmospheric Administration. Retrieved 13 January 2015. ^ (Aitmatov, Kojogulov, Nikolskaya, 1994.). ^ "Archives_2000". Stat.kz. Archived from the original on 5 April 2013. Retrieved 25 March 2013. ^ "О некоторых итогах переписи населения Казахстана". Demoscope.ru. Archived from the original on 3 March 2016. Retrieved 20 June 2015. ^ Dosayev, Yerbolat. "Досье на проект постановления "Об утверждении Долгосрочного плана формирования и развития Алматинской агломерации до 2030 года"". Bestprofi. ^ "GaWC - The World According to GaWC". Lboro.ac.uk. Retrieved 20 June 2015. ^ "National Bank of Kazakhstan". ^ "Ritz-Carlton Plans Kazakhstan Debut by End of 2013". The Gazette of Central Asia. Satrapia. 4 December 2012. ^ "air jamaica | 2004 | 09 - 0068 | Flight Archive". Flightglobal.com. Retrieved 20 June 2015. ^ "1995 | 0880 | Flight Archive". Flightglobal.com. Retrieved 20 June 2015. ^ a b c "Keeping the Lights On in Kazakhstan's Largest City". worldbank.org. ^ "Заголовок :: Новости :: Департамент экологии Акимата г. Алматы - экол…". 21 May 2007. Archived from the original on 21 May 2007. Retrieved 23 October 2017. ^ "Bus stations in Almaty". Caravanistan. Retrieved 2 September 2015. ^ "Almaty train station - Caravanistan". Caravanistan. Retrieved 23 October 2017. ^ "Team picture of the 1977 league champions" (JPG). Akzhajik.ucoz.kz. Retrieved 20 June 2015. ^ "Team picture of the 1990 league champions". Akzhajik.ucoz.kz. Archived from the original (JPG) on 9 December 2011. Retrieved 20 June 2015. ^ emh solutions. "Matches on the high-latitude arena Medeu | Federation of International Bandy". Worldbandy.com. Archived from the original on 20 June 2015. Retrieved 2015-06-20. ^ "Google Translate". Translate.google.ca. 7 January 2013. Retrieved 11 January 2013. ^ "Google Translate". translate.google.co.uk. Retrieved 23 October 2017. ^ "2017 Winter Universiade home page". Almaty2017.kz. 11 November 2011. Archived from the original on 26 April 2012. Retrieved 3 March 2012. 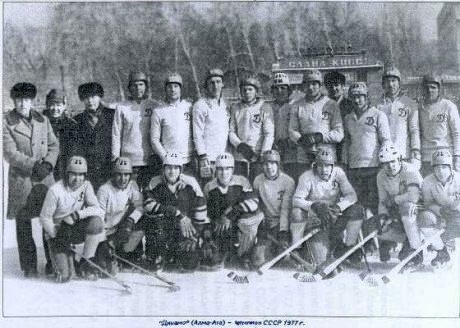 ^ "The Universiade in Almaty could serve as an Impetus to the Development of Bandy". Fisu.net. Archived from the original on 31 July 2012. Retrieved 3 March 2012. ^ "2014 Winter Olympic Games Bids". Gamesbids.com. Archived from the original on 23 March 2007. Retrieved 2 January 2012. ^ "Almaty 2017 home page". Almaty2017.kz. 11 November 2011. Archived from the original on 5 December 2011. Retrieved 2 January 2012. ^ "Kazakhstan's Almaty bids to host 2022 Winter Games". Espn.go.com. 19 August 2013. Retrieved 20 June 2015. ^ "Beijing to host 2022 Winter Olympics". BBC Sport. 31 July 2015. Retrieved 31 July 2015. ^ Lee, Victor Robert (20 December 2012). Performance Anomalies. USA: Perimeter Six. ISBN 9781938409226. ^ "11 Best Books about Kazakhstan | Caravanistan". Caravanistan. Retrieved 11 May 2017. ^ Performance Anomalies | ReadingGroupGuides.com. ^ "Official internet-resource of ALMATY city :: Twin-cities". Almaty.kz. Retrieved 20 June 2015. ^ USSR and Third World, Volume 3. Central Asian Research Centre. 1973. p. 209.